Varuna is a riverboat that sails on the Ganges river, one of the largest and most important rivers in the world. Varuna was designed to navigate every turn and bend of the Ganges, and allows passengers to see new sights of India. There are 12 cabins on board the Varuna which guarantees an intimate cruising experience. All cabins come with large windows to allow for magnificent views of the surrounding areas, a private bathroom and other amenities designed to make your stay as comfortable as possible. The Varuna features an onboard Indian buffet each evening, served in the traditionally styled dining room. 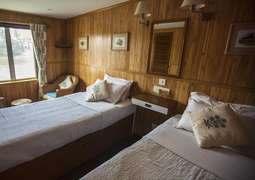 A large Sun Deck with loungers and chairs is available to enjoy the marvellous sights the Ganges has to offer, as well as a spacious saloon to relax and unwind in. There is also a spa on board.